Shortly after season’s end, Winnipeg Jets General Manager Kevin Cheveldayoff said that Ondrej Pavelec would be still be the starting goaltender come October. The GM stuck to his word. Even though Pavelec has been anything but stellar, or even serviceable as a starter, no major moves were made this offseason to shake up the goaltender position. However, a couple quiet moves were made that could paint a bigger picture for the Jets’ future in between the pipes. With roughly 16-million dollars of cap space at the Jets disposal heading into free agency, they could have easily retained Al Montoya, the team’s backup from last season. Montoya, while never being a starter in the NHL, posted some of his best numbers last season with a .920 save percentage and a 2.30 goals against average in 28 games. Following his career best year, the 29-year-old made it clear he would like to return to the ‘Peg. Instead, the Jets let Montoya sign with the Florida Panthers on a two-year deal worth roughly one-million per; a price they could have easily afforded. So why didn’t the Jets feel the need to retain Montoya as a backup? Well, you could ask anybody who watches AHL hockey for an answer. Just over a week ago, 24-year-old goaltender Michael Hutchinson was re-signed on a cheap two-year deal by the Jets. Just over three weeks ago, Hutchison was minding the net for the St. Johns IceCaps in the Calder Cup Finals. Hutchinson got the chance to start for the IceCaps in February, after Eddie Pasquale had season-ending surgery, and he made the most of his opportunity. He had above average numbers in his 24 regular season starts; but the reason Winnipeg feels confident in having Hutchinson, a rookie, play backup next season, stems from the fact that he was the clear MVP for his team during the playoffs. Hutchinson carried the IceCaps to the Calder Cup Finals (where they lost in 5 games to the Texas Stars), and finished with godly numbers. In 21 games his save percentage was .938 and his goals against average was 1.95. Those numbers are very promising, especially when they come from a player who had even better numbers during his first three games in the NHL. 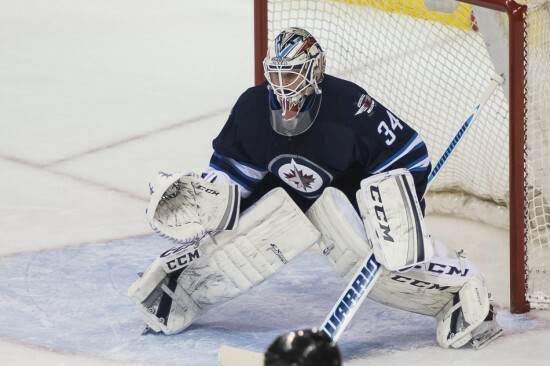 Although the sample size is small, during his three-game stint with the Jets last season he had a .943 save percentage and a 1.64 goals against average. Michael Hutchinson in action against the Boston Bruins, the team that drafted him in 2008, during what ended up being his first NHL win on April 14th, 2014. Even before signing Hutchison (who was drafted in 2008 by the Boston Bruins) last offseason, the Jets were not short on young goaltending talent. Connor Hellebuyck could be their best goaltending prospect after impressing during the last two seasons at UMass-Lowell. At 21-years-old he still has a long way to go before playing in the NHL, but he’s certainly on the right path. 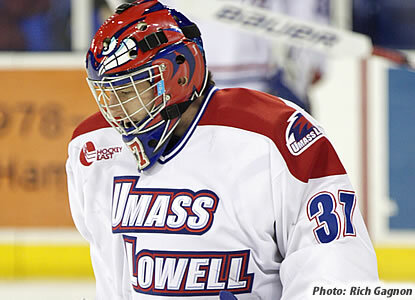 Drafted in the 5th round in 2012, Hellebuyck has made the most of his time at UMass-Lowell, putting up 12 shutouts over the last two seasons with a record of 38-12-2. Connor Hellebuyck has been the MVP for UMass-Lowell during the past two seasons and may end up being a stud in the NHL. Also in the system is last year’s second round pick Eric Comrie, but at 19-years-old, he won’t be brought into the discussion until Pavelec, Hutchinson, and Hellebuyck have all had a chance to make their case. Yes, Cheveldayoff and head coach Paul Maurice are still committed to Ondrej Pavelec (do they have a choice? ), and no, they didn’t make a major move to blatantly threaten his starting position. But, if Pavelec watched even a minute of an IceCaps playoff game, he should feel a little pressure to elevate his game next season in fear of losing minutes to a young up-and-comer. If Pavelec’s play continues to decline and Hutchinson’s continues to rise, it’s only a matter of time before they collide with each other; and Paul Maurice will have to think twice about naming his starter before every game.